Seattle Opera’s good friends and neighbors at the EMP Museum opened their dazzling new exhibit “Fantasy: Worlds of Myth and Magic” to the public today. 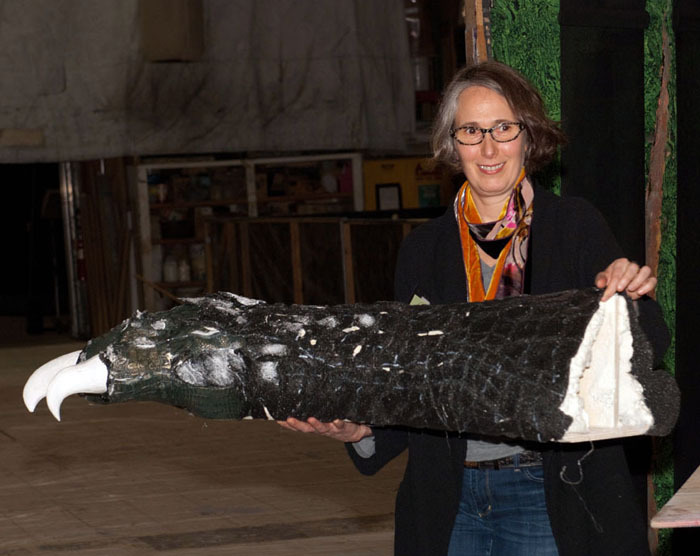 Visitors to the museum are able to get up close and personal with Adalinda, a beautiful dragon caught on a recent excursion to the North Cascades by the talented artists at Seattle Opera Scenic Studios. Adalinda in her new home. Seattle Opera’s team, who have created an entire zoo’s worth of dragons and other beasts for the opera stage over the years, gave us a sneak-peek at how Adalinda (named by popular vote on EMP’s website) was born. We spoke with Michael Moore, Manager of Seattle Opera’s Scenic Studios, about this marvelous monster. Michael, tell us a little about Adalinda and her lair in EMP’s new “Fantasy” Worlds of Myth and Magic” exhibition. 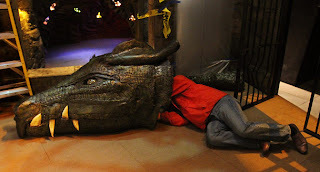 Yes, our shop worked on three main elements: the dragon’s head assembly (including a head, a wing, and a clawed foot), the cave in which the slumbering dragon resides, and the dragon’s tail. 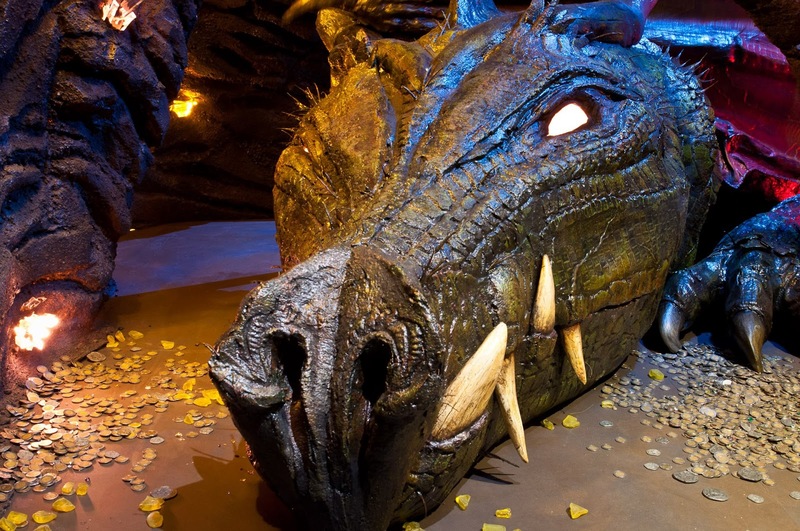 The animatronic dragon seems to be asleep, with a wing that crosses over her body and moves up and down slightly as she breathes. If a visitor gently touches her tail, the dragon’s left eye may open and she’ll make a soft purring sound. But don’t roughhouse with her tail...I’ve tried it, and she doesn’t much like it. 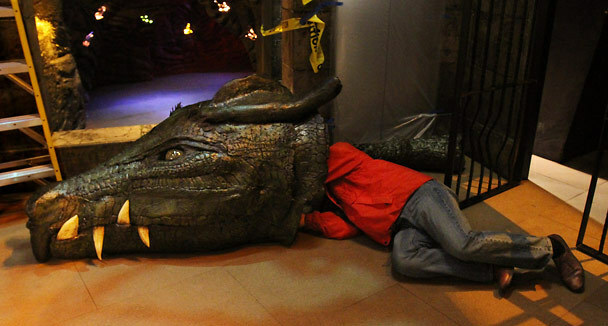 Associate Resident Designer Phillip Lienau with a model of the Dragon’s Lair at EMP’s new exhibit. A great variety of materials, including wood, steel, aluminum, various types of both rigid and flexible foams, plus fabrics, upholstery materials, synthetic skin, and two glass eyes. 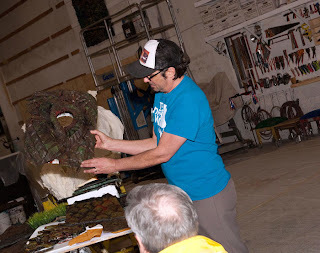 Lead Scenic Artist Rick Araluce explains how Adalinda’s skin is created. Adalinda tips the scales at a relatively svelte 240 lbs. (on an empty stomach). The dragon’s head is approximately six feet long. If she were to open her jaws, she would have a “bite” just a bit bigger than a Great White Shark. The dragon’s claw has a grasp of 18”, her tail is about the length of an adult saltwater crocodile, and if she were to open her wings, they would stretch to more than 36 feet; slightly more than the wingspan of a Cessna airplane. Master Scenic Artist Kitty Kavanaugh with Adalinda’s claw. How many dragons have you created over the years? Over the past 35 years, we have built three different productions of Wagner’s Ring, so we have plenty of experience fashioning Fafners! Ring 1, in the ‘70s, starred a hefty dragon which crawled half-out of its cave on its belly. For Ring 2, we used a different dragon each time we did the cycle—three completely different dragons! Seattle Opera Scenic Studios also created a dragon for a Los Angeles Opera production of The Magic Flute. And of course there’s the fully-articulated dragon for Ring 3, which will be onstage at McCaw Hall this summer. We’ve built various other creatures for the stage, but with Fantasy: Worlds of Myth and Magic, our dragon count is now up to seven. To see all of Alan Berner's photos for the Seattle Times covering Adalinda's installation, CLICK HERE. EMP Museum's new "Fantasy: Worlds of Myth and Magic" is the first exhibition of its kind to examine the proliferation of the fantasy genre in literature, film, television, and video games. From classic folklore to epic tales of good and evil, the exhibition content spans more than four centuries and includes an authentic 16th century suit of armor, rare costumes from the 1939 film The Wizard of Oz, and original hand-edited manuscript pages from J.R.R. Tolkien’s The Hobbit and The Lord of the Rings.